If you live in a small space, you know the importance of space management. A mini freezer is one of those objects that saves you room in an apartment, dorm room, or even in your garage. A mini freezer acts exactly like a normal freezer. The only difference is that it's a lot smaller than a normal freezer. Most mini freezers also contain a lot of the features that the normal ones do. Buy a Mini Freezer Today! But the mini freezer you know today isn't the same as it was in the past. They have certainly come a long way over the years. Deciding which one to buy is often difficult because of the sheer number of products on the market today. However, after learning about mini freezers and the best options available this year, you'll be ready to shop with confidence. In the 1750s, we first invented artificial refrigeration. This became a vastly important facet of society moving forward. You no longer needed to bake fresh bread and eat meat the same day you killed it. Instead, you could refrigerate meats and milk for later use. Almost 100 years later, a leap in technology occurred. The first vapor-compression refrigerator was created, and this signaled the beginning steps to what would later become the modern refrigerator. However, it wouldn't be all the way until 1913 that the closest iteration of the modern refrigerator was invented. The year 1913 brought the home refrigerator. Before, people mainly used refrigerators outside the home. The home refrigerator of 1913 changed everything. In the 1930s, the first freezers made their way into people's homes. Throughout the decades that followed, the freezer would become a hot commodity. As the years wore on, it became clear that freezers could be made smaller. This brings us to the mini freezers that we know today. With all technology, most people associate smaller with better. Phones get smaller. Computer chips get smaller. So, why not shrink down the freezer? One of the main conveniences of mini freezers is the ability to save space. Many people don't have a sprawling home to call their own. A lot of people live in apartments. College students have no room in their small dorms, and a mini freezer is a perfect size for their small rooms. Not only that, but mini freezers work great in garages. Even though most garages are big, a freezer looks so much better when its compact. Having a hulking freezer lounging in the corner may not look the best. When it comes to choosing the best mini freezer, a combination of factors come into play. The features are a big portion of the review process. 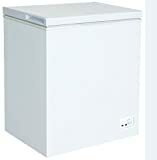 Almost all mini freezers need to have some sort of unique features if they are to compete with the others. Another factor is the price. While a couple of expensive mini freezers made this list, most are more affordable. A lower price means you get a fantastic deal, and that's extremely important when it comes to the best. Combine features and price, and you have the makings for the best mini freezers of 2018. When you search for the positives in a freezer, one of the main things to look out for is the door. It might not seem like much, but mini freezers get bought due to size. A compact size usually means the owner doesn't have a lot of room. This particular freezer includes a reversible door. This means that you can change the door swing to either side easily. You can also change how much the door swings open. Not only does a reversible door make this freezer a great buy, but it also comes with a full range thermostat. You can change the temperature to your heart's desire to suit your needs. Add to the deal a lock and a recommended price range of $250 to $265, and it's a freezer that demands your attention. An excellent buy and reasonably priced. When it comes to the upkeep of a freezer, it can sometimes be a pain when you need to clean it. However, you don't have to worry when using the Midea WHS-109FW1. This handy freezer grants the owner the ability to defrost it. Since this is a feature not seen in many other freezers, it helps the freezer stand out from its competitors. Another outstanding aspect of the WHS is the sheer amount of food you can store in it. Are you planning for a hefty haul of food? No problem! The freezer allows you to store up to 105 pounds of food! And, if need be, you have the opportunity to control the temperature manually. With an MSRP of $175 to $200, you get an amazing value for the quality of the product. This is a freezer that is hard to beat. Efficiency is key when it comes to electronic appliances. The more energy you save, the lower your bill is. As everyone wants to save a few bucks, the Whynter CUF is a great choice for energy enthusiasts. As an EnergyStar certified freezer, it won't run up your electric bill. Along with the energy efficiency, the back of the freezer is designed with a flush back. A flush back means that the back of the freezer fits snugly up against any wall. Since mini freezers are excellent for small spaces, this unique feature makes this freezer a must-have for a compact space. You also can take out and rearrange the shelves. At prices ranging from $220 to $260, the Whynter CUF makes for a fantastic buy. When you have a mini freezer, it's important to keep in mind how adaptable it is. Can you adjust the temperature? How about the inside of the freezer? Can you adjust shelves to your liking? If you purchase the RCA 5.1, then the answers to both of these questions are yes. 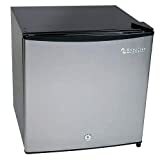 Featuring shelves that can be rearranged and a temperature that can be manipulated, this freezer is a good buy. Not only that, but the RCA also has a front power switch. This is especially handy for a mini freezer and makes the owner's life a lot easier. A defrost drain makes cleaning the mini freezer easy, and the price is also great as it ranges from $150 to $250. Although similar in nature to the Midea WHS, the WHD varies in a couple of different ways. To start off, this is both a refrigerator and a freezer. You get two helpful items for the price of one, so the MSRP price of around $220 to $230 is a deal that is tough to beat. Like the WHS, the WHD allows for temperature variance. It's also easy to clean. However, the other major difference comes with the door. The door is reversible so that you can swing it either way. This is a nice feature to have when you're dealing with a small space. Considering you also get a refrigerator on the bottom half, this refrigerator/freezer combo shouldn't be missed. When you load up your mini freezer, space is important. You don't want to bring home a ton of frozen food, only to find out that your freezer can't handle the load. If this is a concern of yours, you don't need to worry with the SPT. This freezer contains three shelves that you can slide in and out. Plenty of storage space means you can stockpile as much as you want! 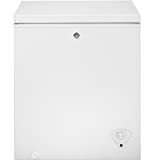 Maintaining a flush back design and a hefty manual temperature setting, this mini freezer is a great deal. At prices ranging from $300 to $350, it's hard to go wrong when you choose an SPT mini freezer. When shopping for the perfect mini freezer, a lot of elements may come into your head. Specifically, you may think about convenience and ease of use. If this is the case, then this GE mini freezer has you covered. One of the helpful features of this particular mini freezer is the "power on" light. There's no need to open your freezer door and see if the thing's even working. Instead, a small light on the outside shows you if the mini freezer is still on. Appearance is also taken into consideration for this mini freezer. Recessed handles make sure your mini freezer doesn't stand out in the room. Instead, it's tucked away, so it doesn't get in the way. A sliding bulk storage basket helps on the inside of the mini freezer, so you can take your food out without getting cold. With an MSRP ranging from $200 to $215, this is one of the best mini freezers on the market today. The temperature of this mini freezer is one of the highlights of the product. All freezers are cold, but this freezer keeps your food frozen between -0.4 to -13 degrees Fahrenheit. This mini freezer is a chest design, meaning it has a slightly different look than rectangular freezers. It stands a bit taller but is still compact enough to make it an excellent buy. A removable gasket makes the mini freezer easy to clean, which makes your life much more simple. Overall, this freezer is amazing. With a recommended price range of $175 to $200, this is the mini freezer of your dreams. All mini freezers come packed with a boatload of features. Temperature controls are a popular addition, but not many come with leveling legs. The leveling legs let you raise and descend the freezer. If something's dripping, you can raise it up to see what's going on. It's a feature that more mini freezers need, but only a few have. This mini freezer is one of them. A reversible door and a recessed handle help make the mini freezer look great and function just as well. The mini freezer also comes with shelves so that you can have multiple rows of foods in it. An amazing deal between $200 and $250. Three shelves are more than usual when it comes to mini-freezers. Due to the compact and small size, two shelves tend to be the normal number. However, Sunpentown stepped up their game and added a third shelf for your convenience. You also have a flush back so that you can place the mini freezer almost anywhere and it will fit. Add to these positive aspects a reversible door, and a thermostat and you have an excellent mini freezer. The only thing holding this mini freezer back is the price. 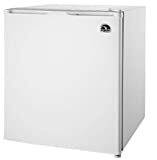 The MSRP price of this freezer ranges from $300 to $350. While a bit expensive, it's still a great buy. After reviewing all of these mini freezers, the winner is the GE 5.0 Cubic Feet freezer. It combines an amazing price with an array of features that makes your life easy. A "power on" light helps the cause, as well as the sliding bulk shelves. You shouldn't underestimate the power of shelves in a mini freezer. They are so helpful and help arrange the frozen food. 19 x 17.75 x 19.25"
19.7 x 18.5 x 33.9"
17.5 x 20 x 27.5"
29.33 x 22.04 x 32.59"
18.5 x 19.37 x 32.95"
19.38 x 21.12 x 33.75"
28.8 x 21.2 x 33.5"
22.2 x 20.59 x 33.5"
20.5 x 18.7 x 20.7"
Now that you know the best mini freezers on the market today, you need to buy one. You never know when you'll need one, and you can find them with ease online. No matter what you're looking for, there's a sea of mini freezers out there, and one of them is bound to fit your unique needs. Take into consideration what you find most important and start shopping today!